Sunday brunch is a last chance to celebrate the weekend before preparing for another lengthy work week. Brunch is a chance for friends and family to get together to eat and share. Some of the most comforting food is brunch fare, from my personal favorite of bagels with cured salmon and cream cheese, to hearty omelettes, crepes, or even corned beef hash. Brunch food is something to be warm and filling. As a counterpart to the food in the Sunday brunch meal, this particular meal has a tradition of imbibing in morning or early afternoon cocktails. Mimosas and Bloody Mary's reign supreme at the brunch table amongst my friends, however the humble Bellini has always been a favorite of mine. 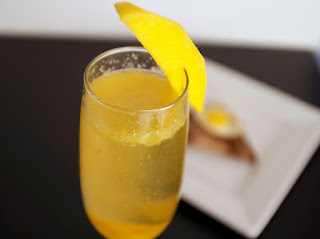 The Bellini originated in Venice, Italy sometime in the 1930's or 1940's as a simple concoction of Prosecco and peach puree, the Bellini made waves across the world (Trex). This can be seen in the growing popularity of Prosecco across North America and Europe as well as the inclusion of the Bellini in restaurant menus across the world. Prosecco is a dry sparkling white wine from Italy, commonly known to be Champaign's more affordable cousin. Prosecco is made from the Glera grape also known as the Prosecco grape, which has been a species enjoyed since Roman Times. Prosecco has actually become so appreciated that it received the status of Donominazione di Origine Controllata (Mionetto), which is a label for wines that designates a small and protected region in Italy. This is the same concept of Champaign coming from the Champaign region of France or Bourbon being authentically distilled in Kentucky. I did not write this recipe to prove that substituting a fruit puree makes a superior product. In fact, in this recipes case innovation is not part of the goal at all. I just wanted to help encourage anyone reading to try subtle experimentation with your food and drink! sometimes the result is failure, but oftentimes the result is unique and something to be prideful of. So try this cocktail out, or substitute the mango puree with a fruit puree of you choice. It's your end of the weekend, enjoy it. Take the puree and pass through a food mill or a fine strainer. Mix 1 part puree to 3 parts Prosecco in a separate container then pour into Champaign flutes. Trex, Ethan. "The Stories Behind 11 Famous Cocktails." Mental Floss. N.p., n.d. Web. 18 Jan. 2015. <http://mentalfloss.com/article/20526/stories-behind-11-famous-cocktails>. "What is Prosecco." Mionetto USA. Mionetto, n.d. Web. 18 Jan. 2015. <http://www.mionettousa.com/whyprosecco.php>.